Why are official growth forecasts always too optimistic? Once again, over-optimistic growth forecasts are being revised downwards globally. The latest such revision by the UK chancellor follows a similar move by the US Federal Reserve, while both the OECD and the IMF have already lowered their respective forecasts for developed economies and pretty much everywhere else. Why do the so-called experts find it so difficult to understand what is really happening in the global economy? Why do they think the answer to weak growth is to encourage more people and businesses to borrow more money, when debt is already a big part of the problem? The latest round of quantitative easing and interest-rate cuts by the European Central Bank shows how desperate the policy-makers are becoming, and how little influence they actually have. The real reason for subdued growth is reduced demand for all non-essential goods and services due to falling real incomes for the majority, brought about by the relative decline of real industry and the financialization of the economy: the idea that we can make money from money. The solution to the problem is to distribute the wealth that is being created in the real economy, meaning productive industry, more evenly. This lack of demand from the poorest two-thirds or so of the population is directly related to the rise in inequality: as more money goes to the rich, less goes to the poor. This results in a ‘waste’ of that wealth, because the rich don’t need it and it therefore loses value. In other words, if more of the real wealth of the economy went to those who really need it, it would have a higher value, because value is always a function of ‘usefulness’ and rarity. 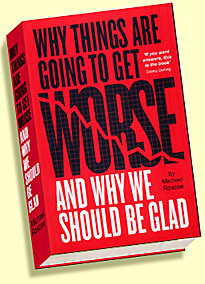 It therefore follows that the build-up of wealth in the hands of the rich – where the money is used for speculation and the creation of more debt, driving up asset prices (including housing costs and therefore making the poor and the middle classes poorer) – devalues that wealth, which would be far more useful in the hands of the less wealthy. 1) Too great a reliance on financial trickery when the reality is that finance doesn’t create wealth, it just shifts around wealth that’s already been created elsewhere, often redistributing it towards the rich via the banking system (because debt repayments are always a transfer from those who don’t have the money to those that do). 2) A belief that GDP figures, which form the basis of much policy making, represent real wealth creation in the economy, when in fact they represent predominantly unproductive activity, including borrowing purely for consumption. So even when GDP rises, which it barely does these days, real wealth creation from the productive sector might still be falling, as is often the case in the modern finance-dominated economy. 3) A failure to understand that our monetary system, in which private banks are responsible for over 95% of money creation, is fundamentally flawed and, unintentionally or otherwise, leads to the transfer of wealth from the majority to the increasingly dominant financiers.